T-lymphocyte. 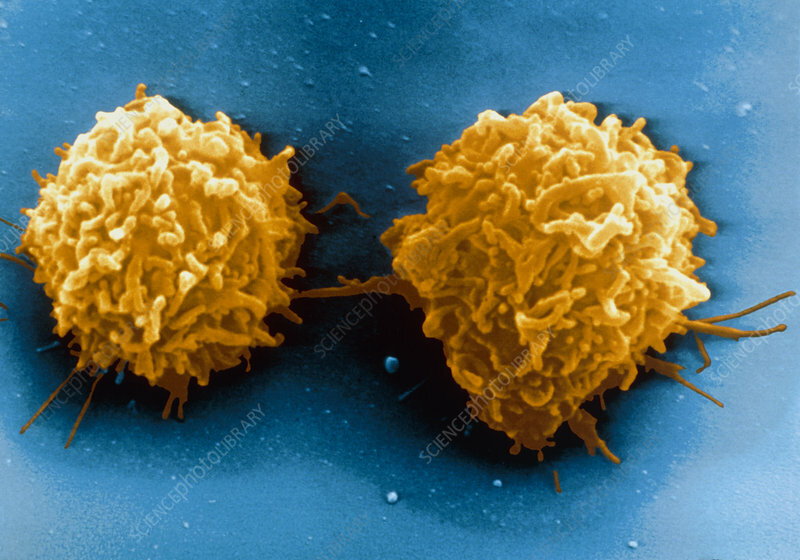 Coloured Scanning Electron Micro- graph (SEM) of two T-lymphocyte white blood cells. Characteristic of normal T-lymphocytes are long microvilli which project from the cell surface. T-lymphocytes are cells of the human immune system, produced in bone marrow and which mature in the thymus gland. It is this cell type that is susceptible to infection by the Human Immunodeficiency Virus (HIV), the causative agent of AIDS. There are three major types of white blood cells: granulocytes, lymphocytes and monocytes, which protect the body against invasion by foreign substances.